Boar 2015 Horoscope foretells that Boars will be full of optimism and confidence. This is because of the beneficial aspect of the Year of the Goat. This will result in increase of emotional strength and monetary fulfillment. The Chinese Boar zodiac sign will be part of many social organizations. They will increase their personal and business circle during the year. They tread into unknown and hostile paths with courage and assurance. The Boar 2015 predictions suggest that they should plan their path to progress meticulously in order to achieve their objectives in life. They will come across a large number of people in their social engagements. Permanent friendships should be made after proper scrutiny. During 2015, Boars will venture into new businesses. With the help of their social contacts they will be successful in their ventures. In the professional field, they will be rewarded for their hard work. According to the Board 2015 Horoscope, Pigs looking for a change in their jobs for improving their status or for financial gains will be successful with the help of their contacts. As per the Chinese astrology 2015 forecast, this year will be a period of financial consolidation. The actual money will accrue later because of the efforts put in during the year. Boars should try to save as much money as possible. The Boar 2015 Horoscope warns you to avoid taking loans in this period. In the Year of the Green Wood Sheep, Boars tend to be more realistic in matters of love and strive hard to understand the view-point of their lovers before falling in love. Pigs are not afraid of family life and in the year 2015. They look for attention from the family. They are devoted to their loved ones. They respect the opinion of family members and close relatives. 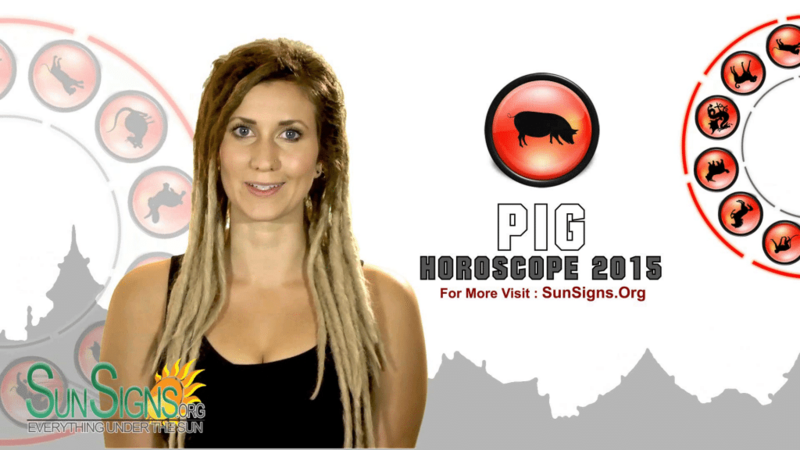 The Boar 2015 horoscope predicts that they enjoy the peaceful atmosphere at home. They love to spend their time with their spouse and children. However they are not ready to spend their energies doing household chores. The Wood Goat Year 2015 is ideal for Boars to go on a long vacation with their families. The serene environment will be enjoyable and relaxing for the whole family. 2015 Chinese horoscope predictions for Boar show that they have splendid energy. They will normally maintain fabulous health this year. They indulge in various activities simultaneously and they might have dirty habits. This may result in mental tension and digestive disorders. The Boar 2015 horoscope foretells that a trip to a quiet place and love from family members will have a therapeutic effect on your health problems. Be ready to face some extra competition when it comes to work this year. But in the long run, this will prove to be to your advantage.